What Have ArchiTEXT and the Design Exchange Done For You Lately? At right: archiTEXT’s Founder Zahra Ebrahim at March’s “What Has Architecture Done For You Lately?” charrette, from archiTEXT’s Facebook group. In case you still weren’t convinced as to who exactly was behind the mysterious “Ned” stencils illegally spray-painted onto sidewalks around the city last month, allow us—in the wake of the unspectacular opening of the Design Exchange and archiTEXT’s “What Has Architecture Done For You Lately?” exhibit—to summarize all of the available evidence, some of it old, some of it new. The Globe and Mail‘s early hint at what would come. ArchiTEXT’s blog says it one more time. 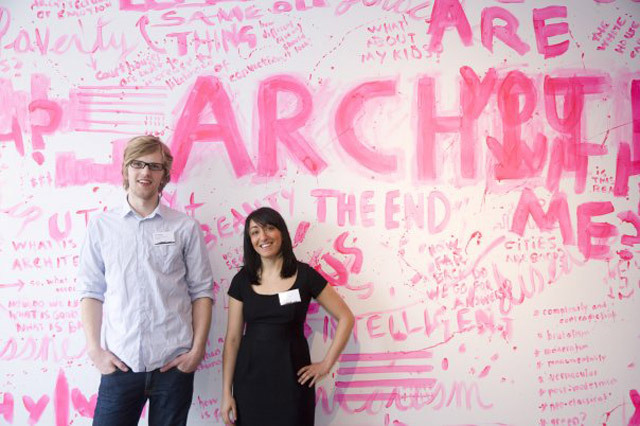 ArchiTEXT and the Design Exchange’s courtship. 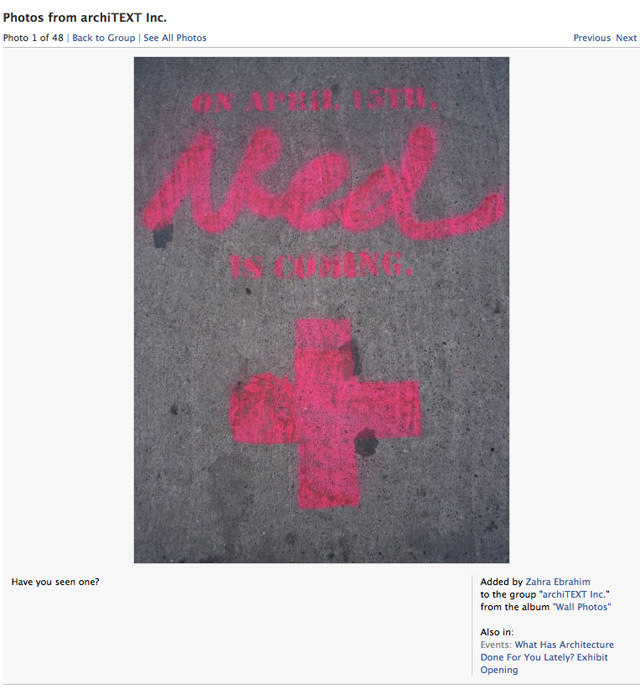 A day later, on March 20, we got another email, this time with a photo of one of the stencils. Matheson’s email read: “If you haven’t seen them yet, I have attached a picture.” It’s the one above. It was at about this time that we started thinking something weird was going on. The Design Exchange’s mailing list. We didn’t yet know about the Globe article or ArchiTEXT’s blog, but on March 23, the Design Exchange sent out an email to their mailing list featuring the graphic above—pink cross, “P.S. NED IS COMING,” and all—and we figured we’d probably found the culprits for the stencils. We contacted both organizations on March 24, and heard back the same day. The Design Exchange and archiTEXT play coy. 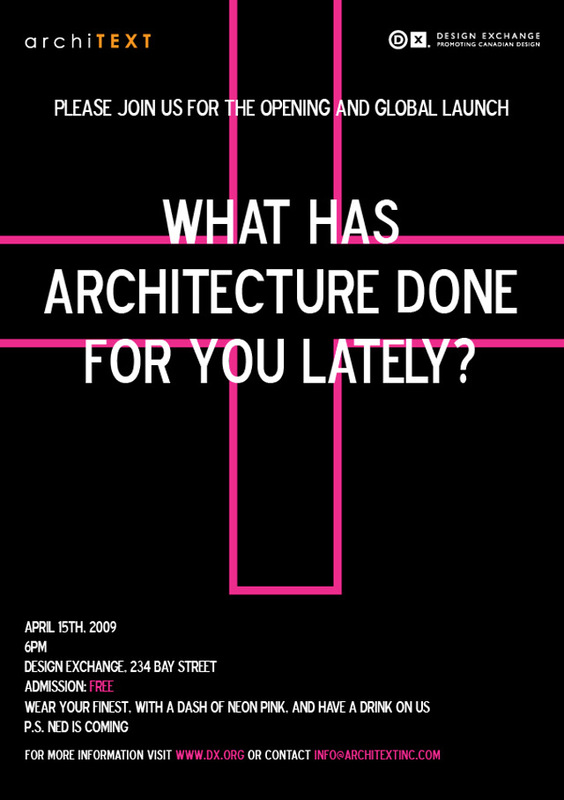 As you know, the Design Exchange is opening a new exhibit on April 15th entitled: What Has Architecture Done For You Lately? As the title eludes [sic], this exhibition is both curated and marketed in a communal spirit – with many voices coming together to create an overall message. Part of the marketing of this grassroots project includes the encouragement of outside participants to get the word out on the upcoming exhibit in creative new ways. 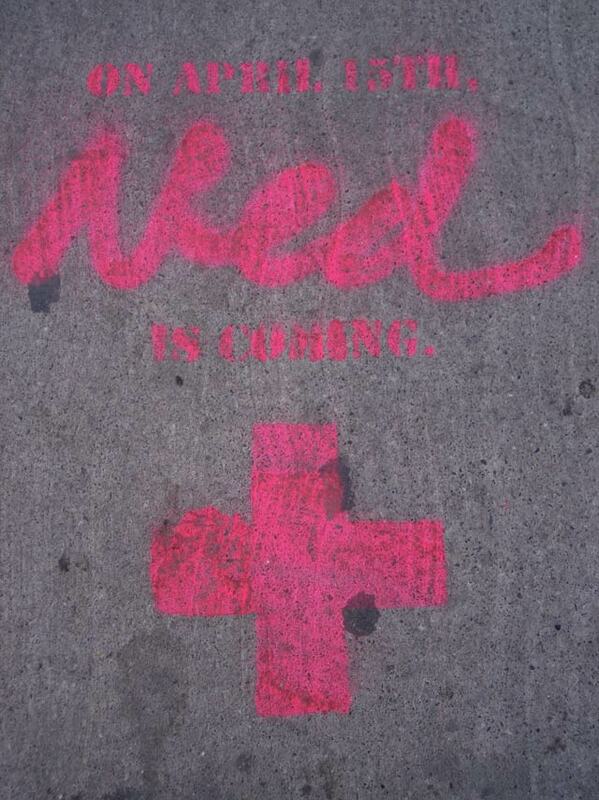 Recent “Ned is Coming” messages found painted on downtown sidewalks are a result of this somewhat “guerilla” marketing approach. The Design Exchange is not behind this provocation – but is pleased with the interest it has stirred in the project. The stencils are pretty cool, eh? 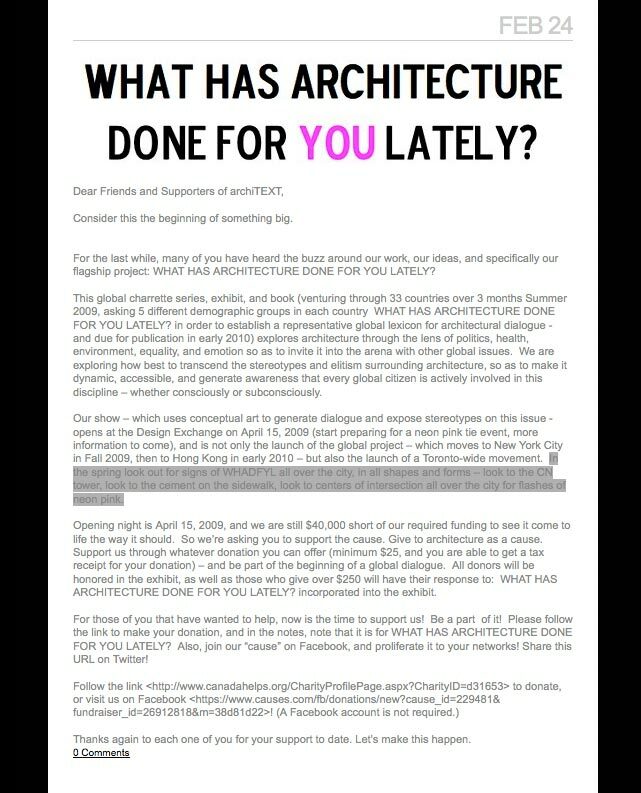 They are promoting our upcoming exhibit What Has Architecture Done For You Lately? Opening on April 15 here at the Design Exchange. I saw that Claudine has already written you, so in avoidance of being too redundant, I’ll keep it short in that we don’t know who has taken it upon themselves to promote our exhibit, but it’s an interesting testament to citizen activism (around architecture at that! )….so far I have seen them here and there in the neighborhoods I use frequently, and I’m not sure how many there are in total. As this is associated with the DX, and we’ve noticed that most of them seem to be fading quickly from when they first started popping up, we have looked into simple graffiti removal for once the exhibit is over – there is a standard product sold in hardware/arts supply stores that cleans up the paint. Turns out, though, that “Matheson”‘s photo exactly matches, pixel for pixel, one in archiTEXT’s Facebook group by Zahra Ebrahim, added by Ebrahim the day before John feigned cluelessness about who or what was behind the stencils. Our article, and the cone of silence. So we went ahead with an article on March 25, confidently concluding then that “the Design Exchange and archiTEXT [are] stenciling teaser ads on Toronto’s sidewalks” and suggesting that, through “John Matheson,” the organizations had tried to trick us into uncritically covering the ad campaign. They were claims that, if untrue, a company would be wise to counter; after all, the stencilled ads are surely illegal, and if Torontoist was wrong (we were confident we weren’t), we could have been sued for libel. All was quiet. And we certainly never heard from John Matheson again. The Design Exchange and archiTEXT play coy, again. So we emailed the Design Exchange and archiTEXT this past week, almost a month after our original post, once the exhibit that the stencils were ads for actually started—another email to Claudine, another email to Zahra, and another email to the Design Exchange’s CEO, Samantha Sannella. Our only reply came from Sannella, who said that “The DX didn’t have anything to do with the paint on the sidewalks – I don’t even know where it is – It could have been done by some of the groups involved with the exhibit – because tons of people were – but no one claimed ownership of it. If the signs are still around – I will have someone remove them.” We were all “uh, really?”, and Samantha’s response was “Sorry… – We are just as perplexed as you are. As far as I know – no one really knows anything.” In spite of the enormous evidence—both explicit and reasonably inferred—our hopes of getting either organization to outright admit any responsibility for the ads seemed to be, like Sannella’s emails, thoroughly dashed. But even without Ebrahim’s seemingly clueless email, we’d have had no reasonable doubt that ArchiTEXT was directly responsible for the stencils, just as we’d have had no doubt that the Design Exchange was—if not responsible for them as well—at least complicit, and surely, by now, playing dumb. For a number of reasons, primarily legal, we can see why it’d be in each company’s best interest to continue to publicly deny any responsibility for the stencils, even as they admit their delight at those same stencils’ existence. Of course, we realize that, by writing about the stencils again, we’re, in one way, only furthering both organizations’ marketing agendas. But to argue that bad advertising does not warrant attention simply because getting attention is exactly what advertising wants is tantamount to encouraging, or at least condoning, further bad advertising; ignoring bad advertising encourages its proliferation more than trying to fight it does (just look at the effect IllegalSigns.ca has had). Besides, for organizations with mandates to serve the public, like archiTEXT and Design Exchange, there is such a thing as bad publicity, and it seems unwise to annoy the significant portion of the population that dislikes it when companies (or anyone else) illegally tag sidewalks, and to treat media organizations like Torontoist as puppets in marketing campaigns. What’s more: as an exhibit, “What Has Architecture Done For You Lately?” is a conclusive failure. (Or that, at least, seems to be the consensus from the few people we know who’ve seen it, including our staffers.) The only thing provoking discussion around an event whose stated goal is to provoke discussion seems to be that event’s totally lame “guerilla marketing” campaign—a campaign that, by the event curator’s own admission, is “inconsequential” to the exhibit it’s for. Which means it might be time for the Design Exchange and archiTEXT to seriously rethink their priorities. Additional reporting by Jonathan Goldsbie. Filed under the design exchange, What Has Architecture Done For You Lately?, zahra ebrahim, advertising, archiTEXT, badvertising, discovery, Mystery, ned, Vandals!